Posted in Misc and tagged Brexit, Sean O'Rourke, Simon Coveney at 10:38 am on April 3, 2019 by Bodger. 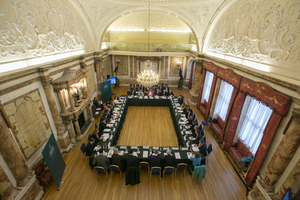 Brexit was raised during Leaders’ Questions in the Dáil. 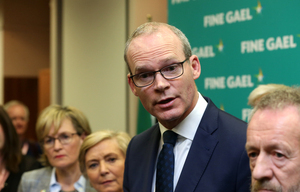 Tánaiste Simon Coveney said he will be bringing two Brexit papers to Cabinet this evening when it meets at 8.30pm. He said the Brexit negotiations have “intensified significantly” in recent days and those will continue. “Ireland is not going to allow a situation where the UK, leaving the European Union without a deal, drags Ireland out of the single market with it. “We cannot allow that situation. And what I mean by that is, the response being a checks in EU ports, on all Irish products. That is not a runner and will cause significant damage to our economy so we will not allow it. 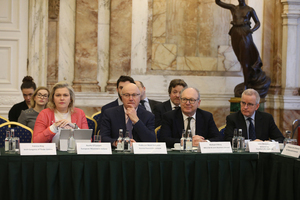 “So what we need to do, and what we are doing now, is we have intensified our discussions with the European Commission on how we respond to that dual responsibility of protecting the Good Friday Agreement and the peace process and the relations on this island as best we can. 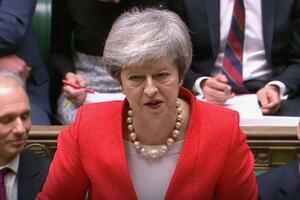 “….We have to find a way of ensuring, as I say, that we protect the single market’s integrity but that we avoid physical border infrastructure on the border. Fianna Fáil’s deputy leader Dara Calleary told Mr Coveney that every party in the Dáil wants to work with him in preparation of a no-deal Brexit. He said members of the Dail should be allowed to see, or have some knowledge of, the Government’s “plan”. 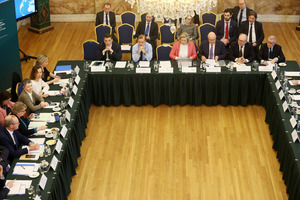 Posted in Misc and tagged Brexit, Dail, Simon Coveney at 2:31 pm on April 2, 2019 by Bodger. 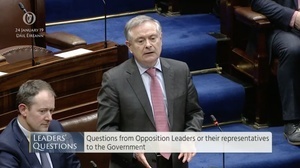 In the Dáil, during Leaders’ Questions. Fianna Fail’s deputy leader Dara Calleary raised the latest homelessness figures with the Tánaiste Simon Coveney. 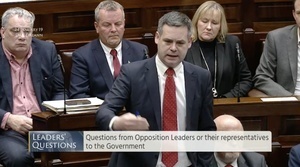 During his contribution, Mr Calleary mentioned an interview the Housing Minister Eoghan Murphy’s gave RTÉ’s Morning Ireland this morning in which Mr Murphy accused journalist Bryan Dobson of speaking from an “ideological” position when the broadcaster asked the politician about the Government’s record on housing and homelessness. Mr Calleary asked Mr Coveney to “finally ‘fess up” and admit the Government’s housing plan Rebuilding Ireland – launched when Mr Coveney was Minister for Housing in 2016 – is not working. 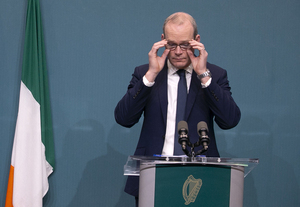 Mr Coveney said nobody is denying the facts and the figures of homelessness in Ireland, and the emotion attached to the same, before going on to cite Rebuilding Ireland figures. “The truth is, deputy, we are listening to others in this house and, indeed, experts outside it. Rebuilding Ireland was always a policy initiative that would change, depending on where the pressures and demands were coming from and that is what it’s doing. “But if you look at the number of people that we are taking out of homeless right now, it’s a higher figure than ever before. “If you look at the number of social houses that are being delivered, it’s higher than at any point in the last decade. Mr Calleary told Mr Coveney his response was the same response he gave in 2016, 2017 and 2018. 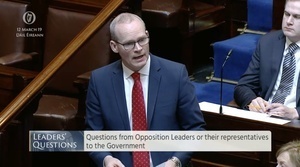 Mr Coveney said there is work to be done but the Government has “changed the housing market in Ireland” with rent pressure zones and increasing the powers of the Residential Tenancies Board. He also said Rebuilding Ireland was a five-year housing plan and the Government is only three years into it. Sinn Féin TD Pearse Doherty also raised the homelessness figures and also raised Minister Murphy’s interview on Morning Ireland. He called on the Government to support a bill proposed by Sinn Fein TD Eoin O’Broin – aimed at preventing buy-to-let landlords from evicting tenants. Mr Coveney also insisted Mr O Broin’s bill will not work “legally or in practical terms”. 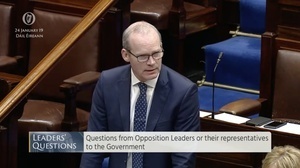 Posted in Misc and tagged Dail, Homelessness, Leaders' Questions, Simon Coveney at 1:35 pm on March 28, 2019 by Bodger. “The Prime Minister set out a clear objective for legally binding change which would command a majority in the House of Commmons in line with the Brady amendment. “We recognise that the Prime Minister has made limited progress in her discussions with the European Union. However, in our view, sufficient progress has not been achieved at this time. “Having carefully considered the published material as well as measuring what has been achieved against our own fundamentalists, namely the impact of the backstop on the constitutional and economic integrity of the Union of the United Kingdom, it is clear that the risks remain that the UK would be unable to lawfully exit the backstop were it to be activated. “The Attorney General’s legal advice is clear in his last paragraph: ‘The legal risk remains unchanged that if through no such demonstrable failure of either part, but simply because of intractable differences, that situation does arise, the United Kingdom would have, at least while the fundamental circumstances remained the same, no international lawful means of exiting the protocol’s arrangements, save by arrangement’. “We want to see a deal with works for every part of the United Kingdom. We will support the right deal with respects the referendum result and Northern Ireland’s place as an integral part of the United Kingdom. 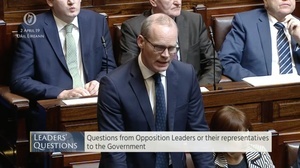 "If the deal doesn't get through tonight there will have to be a General Election"
Posted in Misc and tagged Brexit, Leaders' Questions, Simon Coveney at 4:56 pm on March 12, 2019 by Bodger. 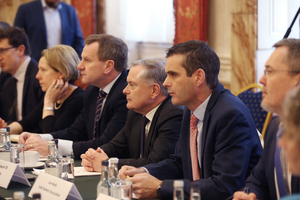 Tanaiste and Minister for Foreign Affairs Simon Coveney chairs a meeting of Brexit ‘stakeholders’. 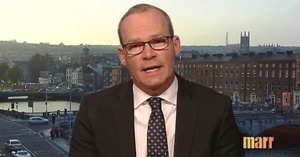 Posted in Misc and tagged Brexit, Simon Coveney at 11:04 am on February 27, 2019 by Bodger. 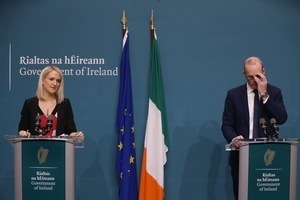 Tánaiste & Minister for Foreign Affairs and Trade, Simon Coveney and Minister of State for European Affairs, Helen McEntee updating the media this morning on legislation which will ‘protect ‘Ireland in the case of a no deal Brexit. Posted in Misc and tagged Brexit, Simon Coveney at 9:57 am on February 22, 2019 by Bodger. 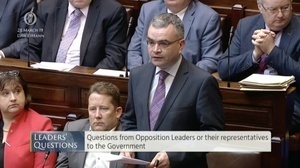 In the Dáil, during Leaders’ Questions, which were taken by Tánaiste Simon Coveney. Fianna Fáil deputy leader Dara Calleary raised the nurses’ strike and asked what the Government has done in recent days to off-set the further strikes which are planned to take place next Tuesday and Thursday and in later weeks. 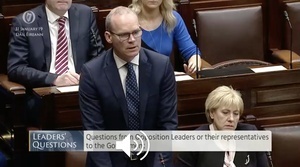 Mr Coveney repeated much of what the Taoiseach Leo Varadkar said during Leaders’ Questions the past two days – namely that the Government “understands the resolve” of the nurses but the Government cannot give pay increases to one section of workers within the public sector pay service agreement without expecting another section to also seek pay increases. He said the Government wants the State’s industrial relations mechanisms, chiefly the Labour Court, to work with nursing unions to come up with recommendations and he called on nursing unions to “fulfil their obligations” too. He also noted the “extraordinary disruption” the strike action caused yesterday but thanked the nurses for their “huge cooperation” in providing essential services. 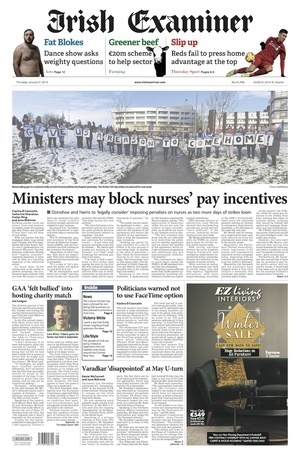 Mr Calleary asked Mr Coveney about an article on the front page of today’s Irish Examiner which claims that the nurses on strike “could see salary rises and pension increases under the existing pay deal frozen and blocked if they don’t call off their all-out strike”. Mr Calleary asked Mr Coveney if he could confirm the contents of the article. He also put it to Mr Coveney that he “allowed” the story to be published. Mr Coveney said the Government “doesn’t give permission to any paper” to print what they wish and that decision is taken by newspapers and their editors. 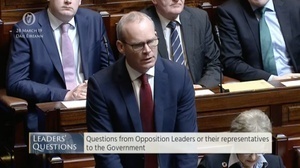 Mr Coveney confirmed the Government is “taking legal advice…consistent with the pay agreement that everybody signed up to with their eyes open”. Posted in Misc and tagged Dail, Nurses' Strike, Simon Coveney at 12:30 pm on January 31, 2019 by Bodger. One of the more objectionable and shameful themes in our squabble about #Brexit is the idea, peddled on @BBCr4today and elsewhere, that it is somehow up to the Irish to sort it out for us. Posted in Misc and tagged Brexit, Simon Coveney at 10:16 am on January 28, 2019 by Bodger. In the past 24 hours. Several matters have emerged concerning the CervicalCheck programme. A backlog in tests – following on from an extra 84,000 women coming forward for tests last year in the wake of the CervicalCheck scandal in April 2018, and Minster for Health Simon Harris announcing the provision of free repeat smear tests – has led to 1,000 women having to have repeat tests because the backlog caused their initial tests to expire and become invalid. The figure of 1,000 emerged last night after Fianna Fáil TD Micheál Martin raised the matter in the Dáil yesterday. It’s now the case that women have to wait, on average, 22 weeks to get the result of a CervicalCheck smear, as opposed to the usual two to four weeks. It’s emerged some 6,000 women will be written to next week and advised to return to their GPs for repeat smear tests. This is in relation to a cohort of women who would have initially tested positive for low-grade abnormalities and who would have then been advised to have an additional HPV test within 30 days of the initial smear test – but their additional smear test was tested for the HPV virus beyond the 30-day limit. The acting Clinical Director of the HSE’s cervical screening programme Peter McKenna this morning told RTÉ One’s Morning Ireland that he’s not sure how it happened but the laboratory [Quest Laboratories] which was testing the smears “started counting the 30 days from the time the smear came into the laboratory rather than from the time the smear was taken in the smear takers’ clinic”. Mr McKenna said that the HSE was alerted to this problem with the additional HPV tests at the “end of November”, while the scale of the problem unfolded in December and the HSE has been trying to identify the affected women since the beginning of the new year. Quest Diagnostics is the laboratory whom the late Emma Mhic Mathúna sued. Several TDs raised the matters in the Dáil this afternoon, with Tánaiste Simon Coveney telling the Dáil that the Minister for Health Simon Harris was told about the additional HPV testing concerns in December. Mr Coveney told Fianna Fáil’s Dara Calleary that the impression Mr Calleary was giving – that the Government is trying to hide something – isn’t true. “The HSE has said that it was made aware of this issue in November, the minister was made aware of the issue regarding secondary HPV testing in December. 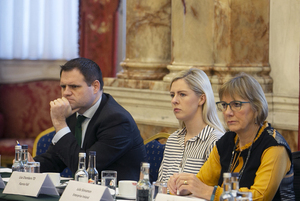 The issue was discussed at the CervicalCheck steering committee including with patient reps who are working very hard at that committee on a range of issues involved and outlined in published weekly reports. Sinn Féin’s Pearse Doherty and Labour’s Brendan Howlin also asked Mr Coveney questions about the matter. Mr Doherty asked for Mr Coveney to be more specific about when Mr Harris was notified of the HPV testing issue. “How come it will be February before these women will be informed that they need to go through another test – two months later? 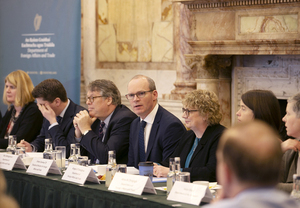 Mr Coveney responded by speaking about the challenges facing the health system, that mistakes are sometimes made and that lessons need to be learned. Mr Doherty pointed out that Mr Coveney didn’t answer any of the questions he asked and repeated them. 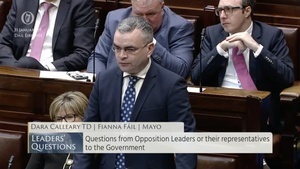 He also further pointed out that Mr McKenna had confirmed the HSE still doesn’t know how Quest Diagnostics made the error – despite the problem being identified in November. Mr Coveney still didn’t answer Mr Doherty’s questions. “The HSE has advised that all of the evidence suggests that even though the test was done outside of the 30-day window, the original results are still very reliable. So can we please try to reassure people here there is not a cause for undue concern. “The delay in getting the CervicalCheck is now 22 weeks according to the HSE. Where there is a problem with a check and recheck is required, that means another 22 weeks. “…How much scandal can the screening programme take? We are absolutely in favour of screening but the problems besetting CervicalCheck programme indicates that something is deeply wrong. “These problems are further eroding confidence in screening and people are anxious. “So, I want to ask specific questions: Can you, Tánaiste, on behalf of the Government, confirm how much additional funding was allocate last year to CervicalCheck. “Two, will the Government commit to full staffing and funding, so that we can get CervicalCheck back on track and deliver the quality service that we all want. “What we have is a new issue, that we didn’t know about. That needs to be addressed, that was raised with the minister in December… And was subsequently raised in a CervicalCheck steering committee. Mr Howlin asked Mr Coveney if he could respond to his specific questions in writing. Posted in Misc and tagged 6000, CervicalCheck, Dail, repeat HPV tests, Simon Coveney at 2:12 pm on January 24, 2019 by Bodger. Posted in Misc and tagged Israel, Simon Coveney at 2:27 pm on June 7, 2018 by Bodger.